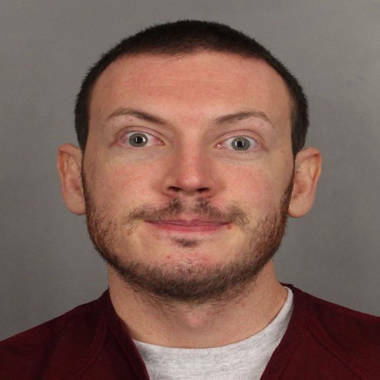 A photo of Colorado theater shooting suspect James Holmes released Sept. 20, 2012. A Colorado court on Monday heard testimony of police involved in the investigation of James Holmes, suspect in the July 20 shooting rampage in an Aurora, Colo., theater that left 12 dead and 58 wounded. The pretrial hearing in Denver focused on a package that Holmes sent to a University of Colorado psychiatrist, but that never reached its destination. It was discovered in the campus mailroom several days after the mass shooting. Defense attorneys for Holmes are trying to determine who leaked information about the package to Fox News, which reported that it contained a notebook detailing violent plans. As the day came to a close with no admission of the leak, defense attorneys said they planned to subpoena Fox reporter Jana Winter who wrote about the notebook's purported writings and drawings, citing an unnamed law enforcement source. "Inside the package was a notebook full of details about how he was going to kill people," the source reportedly said according to Winter's report. "There were drawings of what he was going to do in it — drawings and illustrations of the massacre." Holmes' attorneys called the University of Colorado four days after the attack and asked the school to return the package, according to testimony on Monday. They contend the disclosure about its contents violated a gag order. Holmes appeared in court wearing a full beard, a prison jump suit and shackles. He remained silent during the hearing. Holmes was wide-eyed as he has been in previous court appearances. He looked around the courtroom, which was full for the proceedings. There were about half a dozen shooting survivors and family members of victims present in court. Monday's hearing was delayed from Nov. 14 after Holmes was sent to a hospital for an injury, according to the Denver Post. Citing unnamed sources, the Post reported that Holmes had injured himself by ramming his head into a wall at the Arapahoe County jail. At Monday's court appearance, there was no apparent sign of injury. In testimony Monday, bomb squad officers said the package, addressed to the psychiatrist Dr. Lynne Fenton, was X-rayed for explosives and checked for biohazards after its discovery in the university mail room on July 23. According to testimony, once the package was "cleared," five witnesses were present as the notebook was taken out of a plastic evidence envelope. Campus police Chief Doug Abraham removed the notebook and Aurora police detective Alton Reed "thumbed through it" to examine "burned currency" in the pages of the notebook. Three other officers were present: campus police Cmdr. James Myrsiades, campus police officer Dale McCauley and Aurora police officer Jason McDonald. All the witnesses said they could see that there was some writing in the notebook. Only McDonald testified that he could see some of the text. The shooting happened at the Century Aurora 16 theater during a screening of the Batman film "The Dark Knight Rises." Holmes was arrested in the theater parking lot shortly after the shootings and told officers his apartment contained explosives, police said. That information prompted evacuation of Holmes' apartment building and those surrounding it while law enforcement teams disarmed what they said was the jumble of wires and explosive devices set to detonate by trip wires. Holmes is charged with two counts of murder for each of 12 dead shooting victims, two counts of attempted murder for each of the injured, and one count of possession of explosives. Legal observers believe the case will be dominated by arguments over Holmes' sanity. Holmes allegedly began stockpiling weapons and ammunition for the shooting perhaps months before the incident. About a month before the shootings, Holmes had withdrawn from a Ph.D program in neuroscience at the university. There are varying accounts of whether he was a formal patient of Dr. Fenton. NBC News' Kari Huus and The Associated Press contributed to this report.